Becoming an expat is a challenge in itself. Add to that relocating with kids and you take it to a different level. But what about a situation, when you are about to become a mother for the first time and it happens to be abroad, far away from your family and friends? It can definetely be just a little scary, if I may put it mildly. Of course, Skype and Viber are at your service to call for advice, but online babysitting is not exactly the same thing as a real life grandma by your side. Our older daughter was born in Germany, where it was just the two of us – very determined, but very unexperienced first time parents. I still remember the relief provided by those short family visits. The farther away you live from them, the trickier it becomes. Here, I talked to Elizabeth, the first time mother, living in Brunei. Let’s learn how she dealt with giving birth and bringing up a small child abroad. 1. Please, let us know about your kid (age, place of birth). My son, Matthew, was born in Brunei last July. He is nearly a year old now. 2. How satisfied were you with prenatal and birth care? Did you have any expectations, which were not met? Any misconceptions? The prenatal care was pretty good. I don’t have anything to compare it to, as Matthew is my first child, but I had more ultrasounds than I expected and regular pre-natal check-ups. I was able to get my check-ups done at the local health centre until thirty-two weeks, and then I had to drive up to the hospital where I was going to deliver for the rest, which was a bit of a pain as it was an hour’s drive. But that was because I chose to deliver there rather than the local hospital. I won’t go into details about the birth as I had complications and an emergency c-section. My complications would have arisen wherever I was in the world. However, once it was decided that I needed a c-section I was in the theatre very quickly and, although it wasn’t ideal, the whole thing went pretty smoothly after that. I got my own room in the hospital and a lot of nurses to help out with caring for my son – there weren’t many other babies in when I was there. Unfortunately, there was some building work going on right next to the hospital which meant I didn’t get much sleep during the day. And I gave birth during Ramadan so the food choices weren’t great – lots of chicken and rice – plus my husband really struggled to get any food. But I was well looked after. 3. Did you get any relatives or friends fly over to help you out after you gave birth? I wasn’t originally going to get anyone to come out after the birth, as Brunei is a sixteen hour flight from the UK and it’s a big favour to ask of someone. But then I got a post-partum infection which wasn’t spotted straight away and I had to be readmitted to hospital a week after I’d been discharged. My mum made the decision to fly out while I was in hospital and got here the day I was discharged. Her visit was a life-saver, especially as my husband had to return to work the same time she arrived. It was very reassuring to have someone around who had been through it all before, and her cooking did me a lot of good! 4. Was your husband able to spend some more time with you off work during the first days/weeks after birth? Paternity leave is really short here, only three days, but my husband also took some leave so he had two weeks off before returning to work. As Matthew was born during Ramadan, we also got a lot of public holidays shortly after he had returned to work for Hari Raya, so it worked out quite well. 5. Do you feel like the way you care for your child was affected by the traditions of the country you live in? Fortunately, Brunians are very much in favour of breastfeeding so that has never been a problem – as long as you are discreet about feeding in public then it’s fine. I actually felt more conspicuous in other countries, as many places have designated feeding rooms and I sometimes felt like I should go in there rather than sit and feed in a coffee shop or restaurant for example. When I had problems with breastfeeding early on, I got an appointment with a lactation consultant the same day, and she solved my problems straight away. Other than that, I don’t think we did anything differently because of the traditions of the country, although there are factors about living in Brunei that have affected us. The level of post-natal care is not very thorough here – we had one check-up after our discharge from hospital and Matthew sees the paediatrician every time he is due a vaccination, but other than that you don’t get any appointments or visits as you would in the UK. I felt a little isolated to begin with because of this, but you can always go and see someone if there is a problem and I have formed a good support network with other mums. Online forums are also consulted a lot! Getting out and about is sometimes a bit difficult as not many places are pushchair friendly and there aren’t many changing facilities, not to mention the heat and mosquitoes. But, as with anything, you find ways around these things. 6. 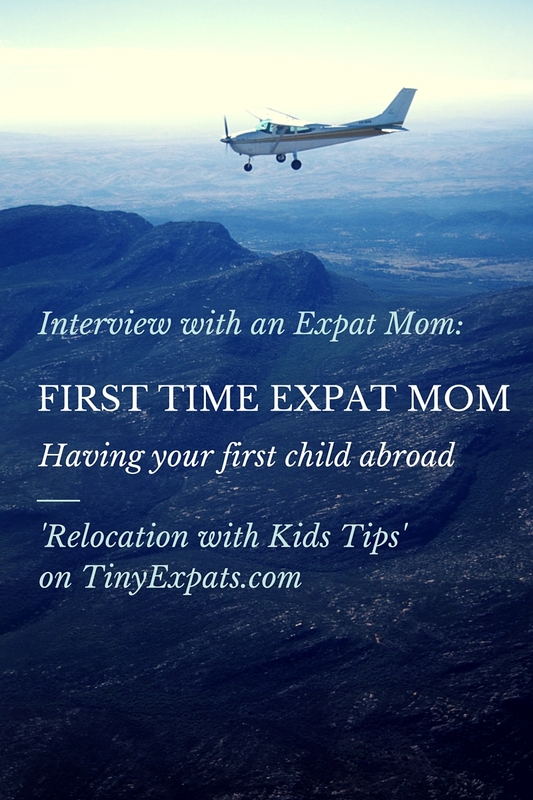 What advice could you give to expat ladies, preparing to become first time mothers abroad? Above all, I would make sure that you are happy with whatever choices you are offered regarding your pregnancy care and birth plan. If you’re worried then it won’t do you or your baby any good. I went for a look around several hospitals, talked to other mothers who had given birth locally, signed up for classes about giving birth and caring for the baby, and read many books. Some people choose to go back to their home country for the birth, some go to the local hospitals and others choose the private option. As long as you are happy with it then that’s fine. It’s also worth finding out about any customs your host country has, for example in the local hospitals in Brunei the father isn’t always allowed to be present for the birth. Different places may have rules that you’ve never even considered, so make sure you are upfront and clear about what you want. And take any offers of help from friends or family – no matter where you are in the world, not much can prepare you for being a first-time parent (in the best possible way) and even things like food parcels can make all the difference when you are sleep deprived and trying to adjust to your new life as a parent. And above all, trust yourself and your new parenting instincts – if something feels wrong then stand up for yourself. It took three doctor’s visits and me insisting that I needed to be admitted to hospital to get my post-partum infection dealt with, because I was so ill my breastfeeding was affected and I knew I needed help. Once I saw a specialist I was treated properly, but I really had to fight to get taken seriously in the first place. Don’t do anything you don’t feel comfortable with, no matter where you are giving birth. Despite my experience not going to plan, I wouldn’t do anything differently and am sure Matthew will enjoy hearing all about the country he was born in when he is older. I used to think that being born in Wales was quite exotic, but that’s nothing compared to Brunei! The fact that I haven’t worked since moving to Brunei meant that I had no stress about taking time off sick when I was pregnant and no need to worry about returning to work now. I know I am very lucky in that respect, and am thankful I get to see him growing up, even if he is turning into a troublesome toddler! You can read this interview with Elizabeth on my Expat Kids blog on BlogExpat.com. You can also visit her blog for more stories about their expat family. Here I talk about becoming a first time mother abroad, with a lady who has plenty of stories about being an expat mother! Great idea for an interview! How nice of you to ask! Not as it relates to this topic! I am however learning quite a bit by reading about expats and am enjoying the international voices here that I hear in beautiful surround sound! Thank you and thanks again!